Samy 32-inch LED smart TV boasts of a 1366 x 768 resolution IPS HD display and comes powered by Android 4.4 KitKat smart TV interface. It uses a pair of 10W speakers for audio output and comes with two HDMI as well as two USB ports for connectivity. 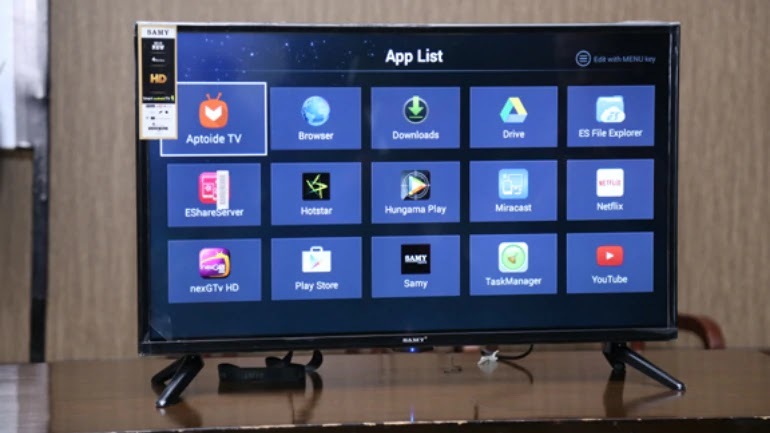 Smart TV has 512MB of RAM and 4GB storage. It is stacked with pre-loaded apps such as Facebook and YouTube while the users will be able to download more via the Google Play Store. It ships with wall mount accessories and the smart TV remote inside the box and weighs a total of 6kg. The Rs 4,999 price tag isn’t inclusive of taxes, which means that its actual price may translate to anything between Rs 7,000 to Rs 8,000 at the time of delivery. Shipping is yet to begin; in order to book purchase through the company application, Samy has made it mandatory for buyers to verify their Aadhar cards.